Triple Savings Event! 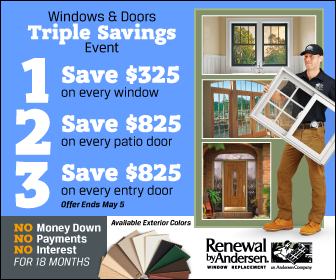 Save $325 on Every Window, $825 on Patio Doors or Entry Doors! If your home’s windows are no longer functioning properly, you need to have them replaced. Learn more about window replacement thru this infographic. "Love the windows and patio door. We want to finish the whole house when we can financially. We give Anderson and employees, especially the sales rep Mike that came to our house, the highest rating. Mike was knowledgeable and courteous. Also not high pressure." "Our installation team was top notch. While they said they were sending a "team"to install 21 windows it was only two people. But I see why, the process was seamless and everything was done correctly and consistently with the leadership of Clayton. We had a tiny problem with one window within a week of installation and their response time was prompt to remedy the situation. Our windows are beautiful. Our home is warm and cozy."